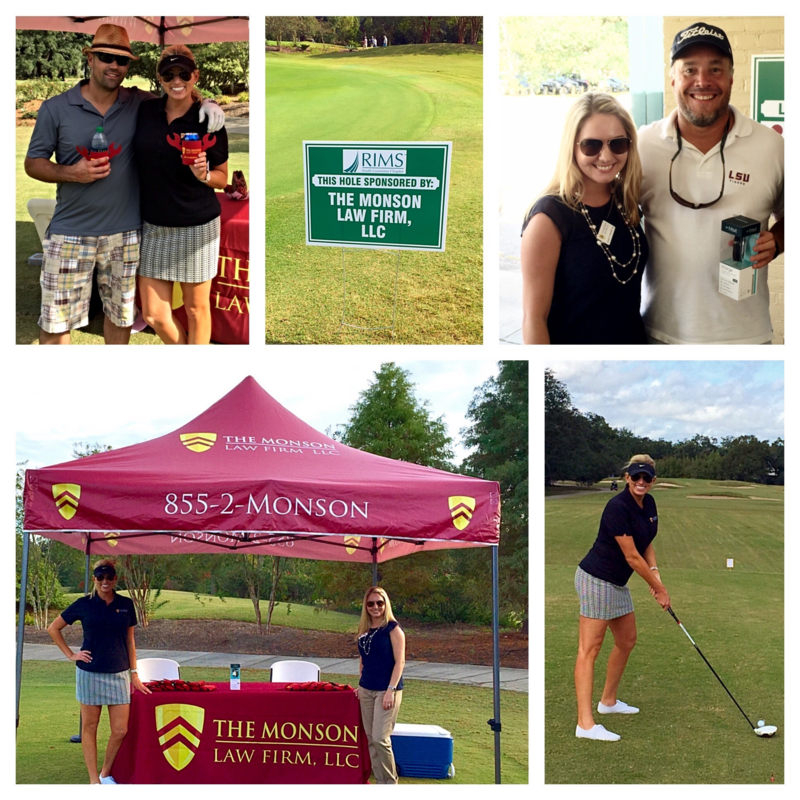 The Monson Law Firm sponsored a hole at the Risk Management Society’s charity golf tournament, which was held at Audubon Golf Course in New Orleans. Funds raised at the tournament are given to five different charities that RIMS selects in December each year. 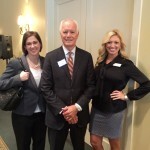 Pictured are Luke Bowman with Young & Associates, Ann’Lee Earles, Marketing Director, Janna Underhill, Esq. and the winner of The Monson Law Firm Fitbit, Mike Montgomery with VeriClaim. Click here to view pictures! 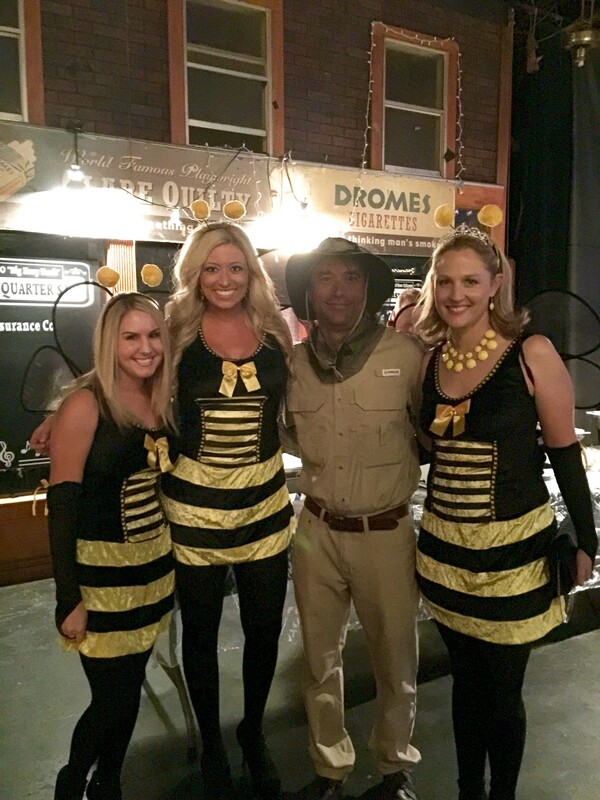 The Monson Law Firm attended the Professional Insurance Agents of Louisiana’s Big Easy Bash at the Howlin Wolf in New Orleans. 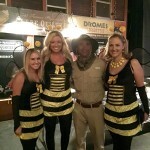 We enjoyed dressing up for this fun event as the two worker bees, the bee keeper and the queen bee! Pictured are Janna Underhill, Esq., Ann’Lee Earles, Marketing Director, Matthew Monson, Esq. and Kathy Monson, Matt’s wife. The Monson Law Firm attended today’s New Orleans Claims Association October Lunch meeting. 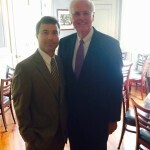 The Louisiana Commissioner of Insurance, Jim Donelon, spoke to the Association about the upcoming election and updated us on the new laws and regulations for the Louisiana insurance industry. Pictured are Matthew Monson, Esq. and Jim Donelon. The Monson Law Firm supports Commissioner Donelon and asks that you show your support for him when you vote in the upcoming election. The Monson Law Firm attended the St. Tammany West Chamber of Commerce’s October lunch meeting at Tchefuncte Country Club. We enjoyed hearing from Louisiana Economist and Professor Emeritus at Louisiana State University, Dr. Loren C. Scott, who provided a regional perspective of trends in the local economy for the upcoming year. Pictured are Sarah Barro, Esq., Dr. Scott and Ann’Lee Earles. 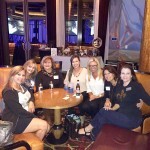 The Monson Law Firm participated in the Professional Insurance Agents of Louisiana’s 1752 Club Saints Tailgate Party at the L’Auberge Casino in Baton Rouge. Pictured are Debbie Harrington with Maison Insurance, Teri Rhodes and Janice Hopkins with National General, Baylie Babin with Imperial PFS, Ann’Lee Earles with The Monson Law Firm, Leeann Manalla (1752 Club President) with Sage Sure and Cloeen Brooks with PIA of Louisiana. The Monson Law Firm Participated in the Baton Rouge Chapter of Independent Insurance Agents & Brokers of Louisiana’s Fall Social. Pictured on top are Baylie Babin with Imperial PFS, Francine Berendson and Karen Kuylen with IIABL and Ann’Lee Earles with The Monson Law Firm. Pictured below are Christie Babin, Michelle Kahoe and Melissa McMorris with Atlantic Specialty Lines. Inc. and Matthew Monson with The Monson Law Firm. On September 11, 2015, the Civil District Court for the Parish of Orleans granted a Motion for Summary Judgment filed by The Monson Law Firm attorney Blake J. Lusk, ruling the insured driver was not negligent in the operation of a motor vehicle. In the case of “Dana R. Williams and Derrick E. Sykes v. Archer Western Construction, LLC, Arch Insurance Company, Imperial Fire & Casualty Insurance Company and Eileen Maldonado,” plaintiffs were guest passengers in a vehicle being operated by Eileen Maldonado when it drove into a large pothole. The pothole was alleged to be the result of road repairs being performed by Archer Western Construction. Plaintiffs made claim against Eileen Maldonado, and her insurer, Imperial, asserting that the accident was caused by Eileen Maldonado’s negligence. Despite opposition from both co-defendants and plaintiffs, the District Court held that Eileen Maldonado was not negligent in the operation of the motor vehicle. Accordingly, plaintiffs’ claims against Eileen Maldonado and Imperial were dismissed with prejudice. The Monson Law Firm attended the Louisiana Surplus Line Association’s 2015 Mid-Year Conference. 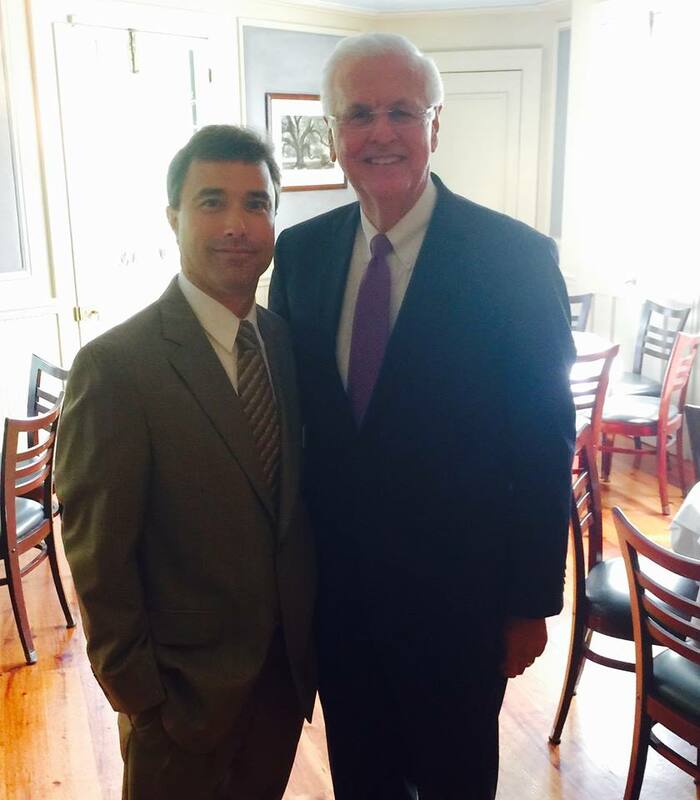 We received a legislative update from the Louisiana Commissioner of Insurance, Jim Donelon. We also enjoyed learning about Ethics from the DOI’s Deputy Commissioner of the Office of Consumer Advocacy and Diversity, Ron Henderson and Executive Counsel, Arlene D. Knighten. Pictured are Matthew Monson, Ron Henderson and Ann’Lee Earles. 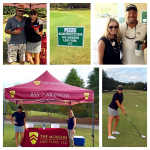 The Monson Law Firm participated in the Southwest Louisiana Claims Association’s Clay Shoot Tournament. All proceeds of the tournament benefited the Special Olympics and the SWLCA. We enjoyed clay shooting with the “Dream Team,” Thomas LaBorde and Beau Saunier with LaBorde Physical Therapy. Also, pictured are Jennifer Engle with MDD Forensic Accountants, Mark Aronson with Electronic Restoration Services, Ann’Lee Earles with The Monson Law Firm, Cliff Royston with Rimkus and Shaundra Schudmak with Lugenbuhl.